Watertown native "Boots" entered the Manlius Military Academy where he was a 3 sport star. 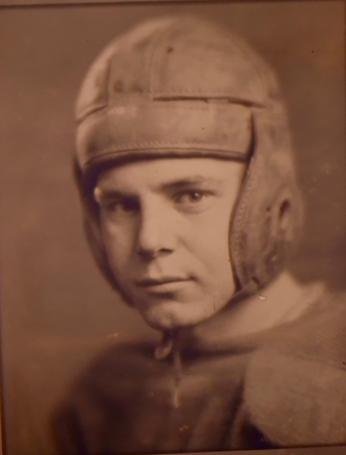 He was also a 1936 graduate of Clarkson University where he also played football, baseball and basketball. He was considered the best NYS small school QB. He was the leading scorer in his basketball team. Gaffney was an inaugural inductee of the Clarkson Athletic Hall of Fame. He was Athletic Director at IHA/IHC for 40 years, where he also coached football, basketball and baseball. His basketball teams capture NNY Catholic League titles in 1953, 1954, and 1956. Gaffney also played for the Watertown Red and Black for 2 seasons and coached them for 4 years. He was a 1995 inductee in the Red and Black Hall of Fame. The North Country Sports Hall Of Fame is proud to welcome Clarence "Boots" Gaffney as part of it's inaugural class.